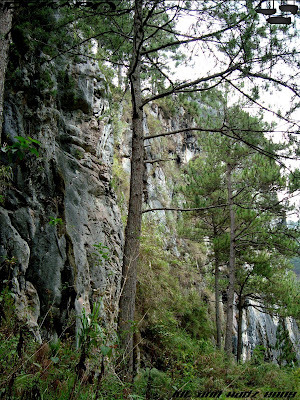 from afar we could almost see coffins hanging by the cliff at the left side and the small town of Sagada to our right. groups of people took pictures as it gives a background so strategically placed that almost everyone lined up for a particular shot. 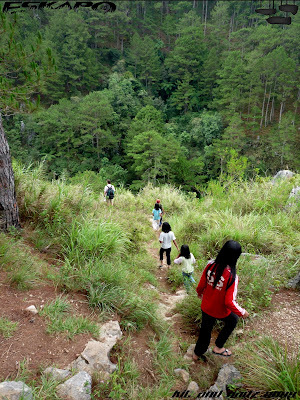 we trek further down along with the Batang Sagadans, whom, together with us were chanting our names and chatted while trekking. it was one of the best ways to experience the local culture. 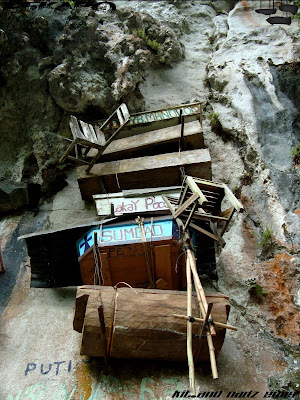 the hanging coffins itself was a enchanting scenery. 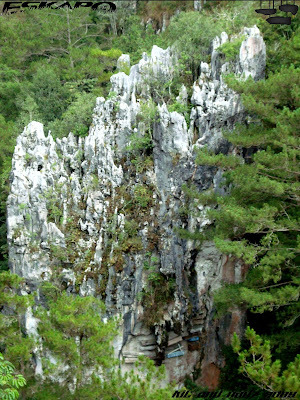 only in Sagada you can find such in the Philippines along with similar traditions found around China. 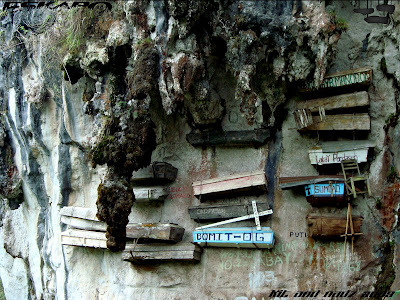 several other hanging coffin sites can be found around Sagada. i thought while my eyes were fixed on them, why would someone hang coffins when you can lay them down flat at the grounds? 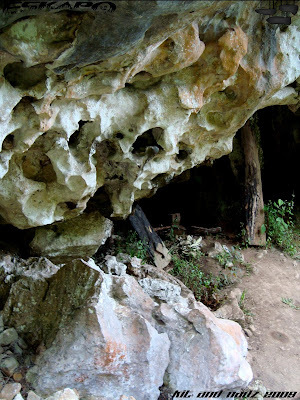 why would someone punch holes at the hard limestone 30 feet from the ground? well, as i was not certain to why, it just ceased my mind to wander but wonder knowing that different culture and place breeds different thinking and thus a different way of life. it made me at awed that Sagadans have such a special way of looking things up. 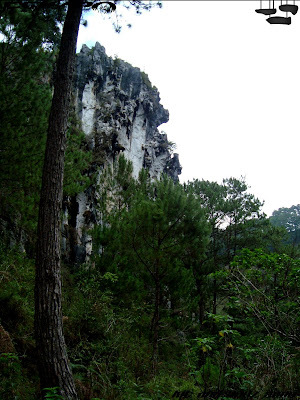 making Sagada more beautiful and a unique treasure and sight to behold. thanks to Nadz for being a guest writer for the two posts feature on Echo Valley and Hanging Coffins. here's a video i found in youtube as posted by crystalthread that will show you a wider perspective of its location. 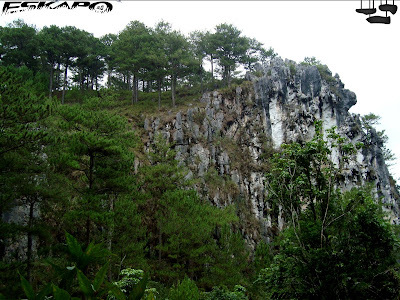 this is from another site still around Sagada. Very interesting and scary. Thanks for sharing. You and your friends are so brave. Take care and be cautious of the flu. One of your footballer (here for the Asian Youth Game), is sick with the flu and the whole team had to be quarantined. Dont worry, they are being taken good care here. The young Footballer is in hospital now. They had to be quarantined to contain the virus so that the flu wont be spread to other teams from other countries. But I wondered if the game would be cancelled if there are more cases from other countries too. Saka, it's interesting to see chairs na naka sabit along with the coffins. thats really something else,. in good way,. :) doesn't look as scary as i expected,. ung mga sulat ba sa bato, part talaga or legal,.? or someone just wants to have his name written beside a coffin? Ganda! 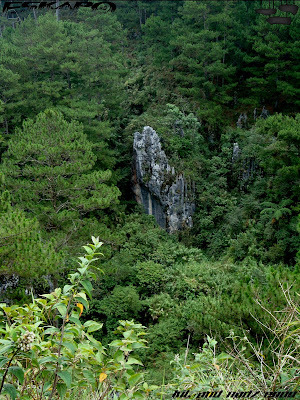 Kelan kaya ako makakapunta ng Sagada? Hayz. That is so weird! Very interesting! kakaiba talaga ang kultura satin,may mga tradisyunal tayong ginagalawan. ang galing ng kuha mo pards.lalo na yung nasa bottom pix. What are those coffins made of? Are they doing something to prevent it from deteriorating/decomposing? pero sa totoo ganda nyan at sana someday makapunta din ako sa places na napupuntahan mo. Interesting sight. I've been intrigue ever since I saw this on TV. Glad you had a chance to visit this place. Just curious, do they embalm the bodies before hanging them up there? is that a chair in the last pic? different beliefs and different cultures make our dear old pinas truly worthy to explore. a very interesting practice. i wonder why they do that. Ayun oh! May upuan na nakasabit! Ano sinisymbolize ng upuan sir dong? Amazing! I was looking at those labels (writings) on the coffin. There are even vandals. Their group is so admirable to have preserved this tradition. Kakatakot! wala ka bang nakita o nameet na kakaibang nilalang dun? haha. Astig talaga! adventure super. may practices pa palang ganyan dyan sa sagada, paano naman kaya ang health hazard na maidudulot nyan sa mga taga sagada? malayo ba sa kabihasnan yan? Dong, it crossed my mind, hanging them up there, they r bound not to last too long.... the ropes decompose etc.. do they drop off after a while or do they use metal hooks to secure etc? this is very interesting - hanging coffins ? How did they hang it there in the first place ? What if it rots ? its not as scary as i thought it would be. great dong! Saw this hanging coffin sa tv and it's really amazing noh? Glad you experince the real thing. Siguro If I were there matatakot ako hahaha!!!! I had never heard of this before I read your blog this morning, my friend. What an interesting custom. Thanks for sharing these amazing photos. That's very interesting. I also wonder about the reason behind hanging the caskets instead of burying them underground. seen this in one of docu shows, pero siguro iba ang feeling pag ikaw mismo ang makakita anoh? anu na feel mo nung nakakita ng ganyan? wow, inggit tlaga ako sau friend! khit sa'n ka lng pumupunta, hehehe... hanging coffins ba tlaga yan? wow, weird! Very interesting. The coffin has a very modern looking writing. Was that new? look scary. tapang nyo dong. parang hindi ko kaya pumunta sa ganyang lugar. hindi ba mabaho jan? Wow, that is creepy! I would not want to be near that place at night! 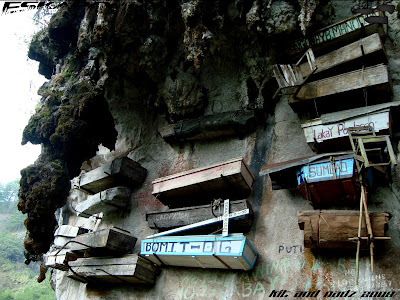 astig naman nung hanging coffins! astig ung pics mo ng malapitan!